This essay was first published in the 2003 Shout! Factory DVD release, You Bet Your Life: The Lost Episodes. “Here he is . . . the one . . . the only . 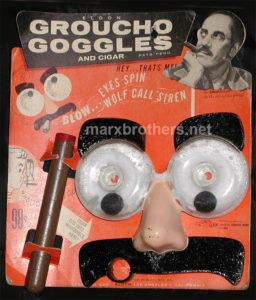 . . GROUCHO!” Between 1947 and 1961 that phrase began 528 episodes of You Bet Your Life starring Groucho Marx. By any standard the number is astounding. It’s a very rare feat today for a show to reach even 300 episodes. To put it in perspective, there were 270 episodes of Cheers and 251 episodes of M*A*S*H. Add them up and there are still seven more episodes of You Bet Your Life. The Simpsons (313 episodes in their first fourteen seasons) would need nine more seasons to match Groucho, who, incidentally was seventy years old during the final season of You Bet Your Life. Let’s see what Homer Simpson looks like at seventy. At the start You Bet Your Life did not seem like it would be a long-running hit show. By 1947 Groucho had already been in show business for over forty years and his long career seemed to be reaching its end. 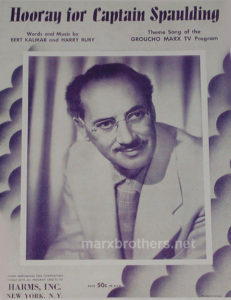 The Marx Brothers had retired from the movies, and Groucho was working mostly as a guest star on radio shows hosted by stars like Dinah Shore, Rudy Vallee and Al Jolson. Groucho had failed on radio with a few different shows of his own, including two with his brother Chico. He’d had a brief run as the host of Pabst Blue Ribbon Town, but he couldn’t develop the staying power in radio that contemporaries like Jack Benny and Fred Allen had found. Guedel was impressed with Groucho’s ability to ad-lib and realized that he was held back in radio by the medium’s rigid adherence to scripts. After the show Guedel met with Groucho and offered him a chance to host a quiz program, suggesting that the format would allow Groucho to ad-lib and be spontaneous. Groucho was not impressed with the offer and considered the job of quizmaster an indignity for a man with his show business credentials. Guedel surely recognized this. In 1949 he would tell Time that “Having Groucho as emcee of a quiz show is like using a Cadillac to haul coal.” But further discussions with Guedel finally resulted in Groucho agreeing to make a demonstration record. Groucho and Guedel each put up $125 to finance the recording. It was made on September 15, 1947. Since Guedel was the producer of Art Linkletter’s popular shows House Party and People Are Funny, the record was made at the CBS studio where House Party was recorded. They used his band, led by Billy May, and his announcer Jack Slattery. [The demonstration recording, which features an obviously nervous Groucho, is included in this collection.] In this very first outing for the show, its most famous trademark was already present. At the outset Slattery announced that any contestant uttering the “mystery word” would win $1000. It didn’t take long for the “mystery word” to become the “secret word.” In fact, by the end of the audition disc Groucho was calling it the “secret word.” Armed with the record Guedel set out to sell You Bet Your Life. All three networks turned him down. But he quickly found a sponsor, and the Elgin-American company agreed to buy the air time for the show. They went to ABC since it was the newest and least expensive network. It was also the smallest and least successful. After initially planning to broadcast You Bet Your Life live, Groucho and Guedel decided that it would be recorded and edited for broadcast. This would turn out to be a major factor in the show’s success. Allowing the show to run for about an hour gave Groucho the opportunity to ad-lib without worry. Material that didn’t work could simply be removed when the show would be cut down to broadcast length. But You Bet Your Life was not an overnight success. A New York Times reviewer wrote, during the first season, “Among radio’s unsolved problems is the full utilization of the talents of Groucho Marx, a man of both brains and capital comic ability. Over the years he has been subjected to virtually every type of format but none really has worked out too well. Unfortunately that state of affairs still exists apropos his current effort, You Bet Your Life.” But the show slowly developed an audience as Groucho became more comfortable. He even won a Peabody Award as the best comedian of 1948, being recognized as “the only man on the air who can work without a script and bat off a brilliant succession of witticisms.” In a 1949 Time article Groucho said, “In the old days they almost threw me off the air if I deviated from the script. I had to sign a written pledge that I would read only what was before me. But now I’m doing what comes naturally. It’s like stealing money to get paid for this.” At the time, Groucho was “stealing” $3000 a week. For any successful radio program in the late 1940s, talk of television was inevitable. 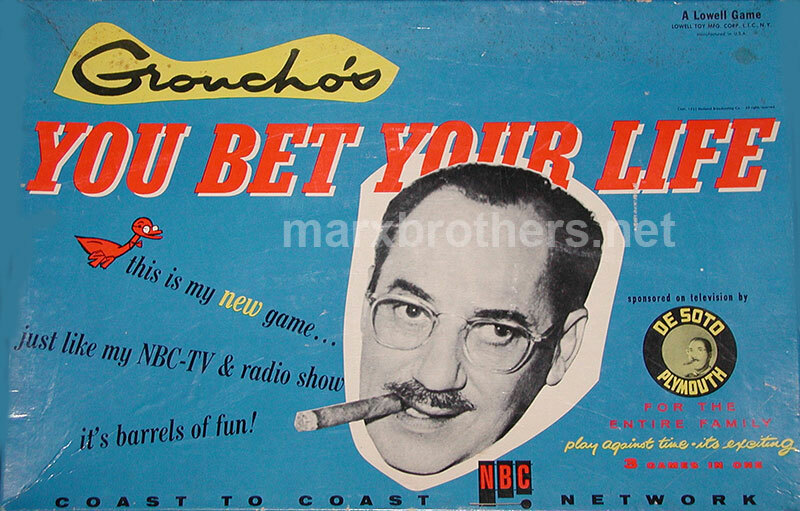 In June 1949 Variety reported that Groucho was negotiating with several film companies to produce a television version of You Bet Your Life. In December a test film was shot as the radio program was being recorded. 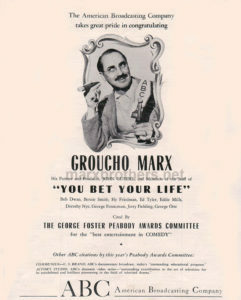 It was assumed by both Groucho and the network that the show would make its transition to television on CBS, but Guedel, Groucho and brother Gummo — Groucho’s manager and agent at the time — thought it would be wise to put the show on the open market just to make sure they got the most favorable deal from CBS. By the spring of 1950 CBS and NBC were involved in a bidding war over the television rights to You Bet Your Life. Newsweek reported that “Groucho’s eyebrows are wobbling at the thought of TV.” Groucho told Time: “I am being wooed for the first time in my life. I’m like a dame hot out of Vassar.” CBS Chairman of the Board William S. Paley flew in from New York to make his offer. Groucho recalled, in The Secret Word Is Groucho, his 1976 book about You Bet Your Life, that Paley had followed him into the bathroom and locked the door. “‘Look’ he said to me, ‘you’re a Jew and I’m a Jew. We should stick together. You can’t afford to sign with NBC.’” Groucho was offended and noted that David Sarnoff of NBC was also Jewish. When it was all over NBC had managed to take You Bet Your Life away from CBS. The Variety headline on June 7, 1950, read, “Paley, Staffers Wail ‘Ouch-o’ In Loss of Groucho.” Groucho remarked, “It was a tough fight but I won.” Indeed he did. The new deal called for Groucho to be paid $4800 a week and to retain thirty-eight percent of the show’s profits. It was a ten year deal that included annual raises and a thirteen percent profit sharing deal for Guedel. NBC had guaranteed $4 million to You Bet Your Life. On October 5, 1950, You Bet Your Life made its television debut on NBC. The previous evening it had been broadcast — in a slightly different version — on NBC radio. You Bet Your Life would continue on radio until June 10, 1960, leaving the airwaves one season before its television counterpart. On television You Bet Your Life was not much different than it was on radio. But there was one small change. In the early episodes a contestant saying the secret word caused a loud alarm bell to sound. Groucho found this very annoying and suggested that something should drop down — “An elephant or a pretty girl or a duck or something.” Groucho had said the secret word. The duck became a signature image for the show. Apart from the duck there were no visual elements added for television. Production of the show didn’t change much either. The performance still ran for about an hour and was recorded for radio and filmed simultaneously. Very often material had to be edited out of the show because Groucho’s mind worked a little too quickly and he’d make a racy or downright dirty joke before he could stop himself. Or sometimes a contestant would inadvertently lead him down that path. Groucho would look straight at the camera and remark, “This is what’s known as a waste of film.” Or he’d glance over at the director and simply say, “Clip clip.” But fortunately that film was not discarded. The editors compiled an annual reel of Groucho’s unairable moments for the sponsors’ convention. Many of these moments — and the occasional non-filthy mishap, like the duck coming down and making a perfect landing on George Fenneman’s head — can now be seen for the first time in this collection. You Bet Your Life’s popularity translated easily and immediately to television and the show was in the top ten right from the start. And on January 23, 1951 — after slightly less than four months on the air — Groucho was presented with an Emmy Award as the most outstanding television personality of 1950. When the show first came to television, Groucho was often asked about his moustache. The familiar greasepaint version from the movies was long gone and had been replaced by a real one. Asked about his real moustache in 1952 by TV-Radio Life, Groucho said, “My wife made me shave it off the first week I had it. My producer, John Guedel, made me grow another one. Three months later I had the moustache, but I didn’t have the wife.” He wasn’t kidding. His second marriage had ended in divorce the previous year. The weekly parade of ordinary folks, offbeat characters and people with strange occupations rolled on as the show sat at the top of the ratings. But there was one unpleasant bump in the road. From the beginning the show always had a ten to twelve piece orchestra. Original bandleader Billy May departed after the first radio season and was replaced by Stanley Myers. Myers left during the second season and was replaced by Jerry Fielding, who held the job until December 1953. But Fielding didn’t leave of his own accord. Nor was he ever formally fired. The Communist witch hunt of the early 1950s had come to Hollywood in 1953. The House Un-American Activities Committee came to town with a subpoena for Jerry Fielding. They actually served it to him at the show. 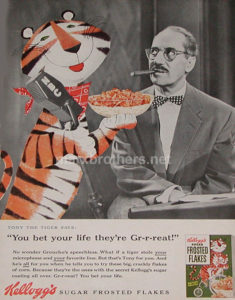 Fielding brought it to Groucho and offered to quit. Groucho laughed it off and said he would not stand for a political firing. NBC initially encouraged Fielding to be a cooperative witness, but the network’s feelings on the subject changed when Fielding asked, “What do I say when they ask me about Groucho?” NBC and DeSoto feared that the committee might be using Fielding to get to Groucho. After all, Groucho could easily be linked to several of the liberal organizations that the committee considered Communist fronts. 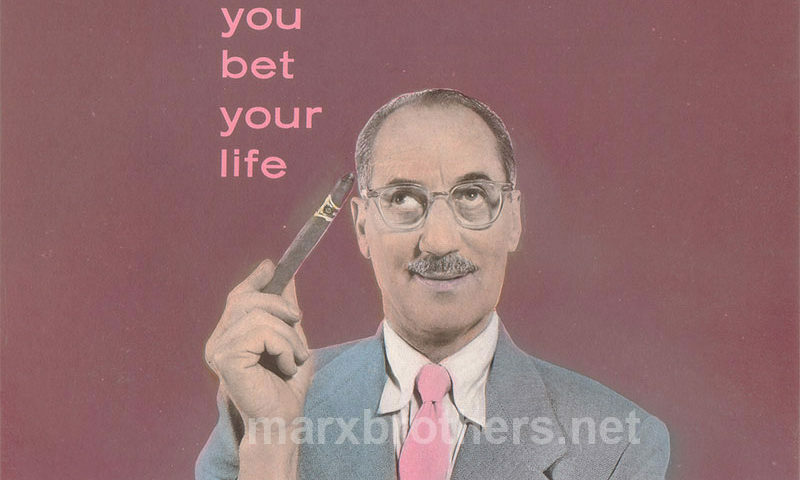 By 1960 Groucho was making $7000 a week on You Bet Your Life. Each Wednesday night for the past ten years he’d eaten dinner at the Brown Derby, walked half a block down Vine Street to the NBC Studio and filmed You Bet Your Life. An hour and a half later he’d drive home. The ninety minute work week was probably a good reason that Groucho didn’t tire of the show, but the end was near. In a February 1960 interview he remarked, “I don’t want to eat at the Brown Derby every Wednesday night for the rest of my life.” During the final season plans had been made to syndicate You Bet Your Life. Groucho had once said, “I’m relieved when people say they’ve missed my show. I don’t want them to see me every week.” Now it would be possible for people to see him every day. When John Guedel started to select episodes for syndication a former staff member from the show’s early days was uncooperative. As a precaution and since there were so many episodes to choose from, none from the first four seasons were used. Almost all of these episodes, coincidentally, had the blacklisted Jerry Fielding as the orchestra leader, so it just seemed easier to avoid any trouble by preparing a syndication package without them. Additionally several episodes from later seasons were also left out for various reasons that are now trivial. In making the shows acceptable for syndication in 1960 some editing that would be considered ill-advised by today’s standards took place. The set always had the sponsor’s logo — usually DeSoto-Plymouth — on it and Groucho’s microphone had the NBC logo on it. The films were blown up and the framing changed to omit the sponsor logos. The NBC logos were blurred or burned out of the picture frame by frame. Needless to say these films, which were retitled The Best Of Groucho, did not present the show in its best possible light. A show that was shot on thirty-five millimeter film and carefully edited now looked no better than any primitive kinescope from television’s early days. There were 250 episodes edited in this manner, and those films are what the public has seen of You Bet Your Life for the last forty years. The syndication package was eventually pared down to 130 shows so many episodes of The Best Of Groucho have been out of circulation for decades. For a handful of episodes the original network prints of You Bet Your Life are lost and all that survives are The Best Of Groucho versions. (One such episode is included in this collection.) 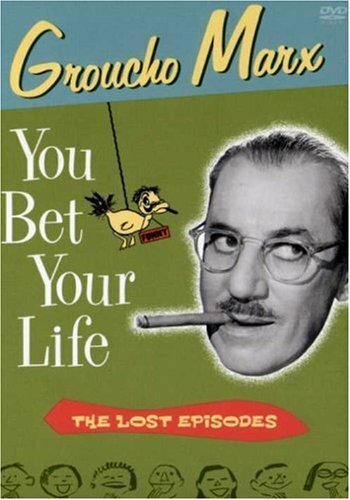 The summer repeats of You Bet Your Life were also called The Best Of Groucho, but those shows were not edited. The only modification was either the replacement of the original opening with a Best Of Groucho opening or the addition of a newly filmed introduction by George Fenneman. In most cases the original prints were used for the summer repeats so several of the prints that survive for those episodes do not have the original You Bet Your Life opening. Now, with the cooperation of the UCLA Film and Television Archive and The Library of Congress Motion Picture, Broadcasting and Recorded Sound Division, the original prints have been located and restored for this collection. Eighteen episodes – including some that have not been seen in over fifty years – have been digitally remastered. So, here he is — restored to his original glory, in pristine condition on DVD, with lots of rare bonus material — the one . . . the only . . . GROUCHO!